OKEECHOBEE, Fla. -- Six people are facing drug charges after a narcotics search warrant was served in Okeechobee. At approximately 5 a.m. on Tuesday, April 16, 2019, members of the Okeechobee County Sheriff's Office Narcotics Task Force, along with agents from the Florida Department of Law Enforcement and DEA served the warrant at 1124 NE 16 Avenue in Okeechobee. Authorities confiscated marijuana, crack cocaine, an unknown substance (that was packaged for re-sale), loaded magazines, drug paraphernalia and $3,300 in U.S. currency during the search. Sheriff Noel E. Stephen stated, "We have been executing search warrants on this house for over thirty years. We will continue to do so as long as the residents continue to sell illegal narcotics. The people of this community don’t deserve it nor will we allow it!" Six subjects were arrested and face multiple charges. 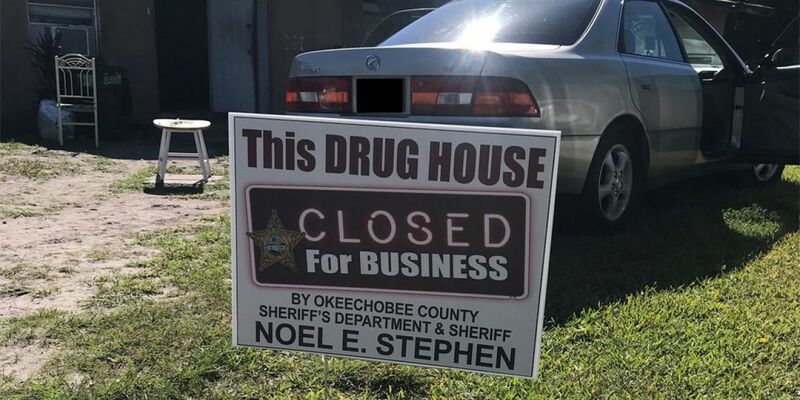 After the arrest the Sheriff's Office placed a sign outside the home that reads, "This drug house closed for business by Okeechobee County Sheriff's Department & Sheriff Noel E. Stephen.